PennsylvAsia: 2018 Greater Pittsburgh Lunar New Year Gala, February 10 in Wexford. 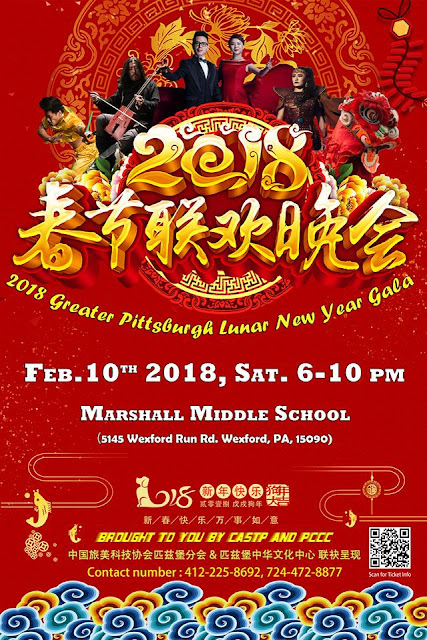 2018 Greater Pittsburgh Lunar New Year Gala, February 10 in Wexford. The Chinese Association for Science and Technology - Pittsburgh Chapter and the Pittsburgh Chinese Cultural Center will present its 2018 Greater Pittsburgh Lunar New Year Gala on February 10 at Marshall Middle School in Wexford. Greater Pittsburgh Chinese New Year Gala will be the best performing arts show for Lunar New Year celebration in greater Pittsburgh area! Famous artists from China joining this year gala include Mr. Shan Jin, the most outstanding young Matouqin artist in China; Talintuya, the rising star of one of the best young solo singers; “GeWu Legend”, one of the most popular singing mix in China. Plus, for the first time ever, we will offer New Year's eve family dinner for all the audience, before the gala begins. Tickets start at $15 and are available online. Marshall Middle School is located in Wexford (map), roughly 20 miles north of Pittsburgh.